The Trust is established in line with Department for Education requirements and consists of 5 Members and 9 Trustees whose names can be found below. At the bottom of the page, you will find documents pertaining to the work of the Trust Board. 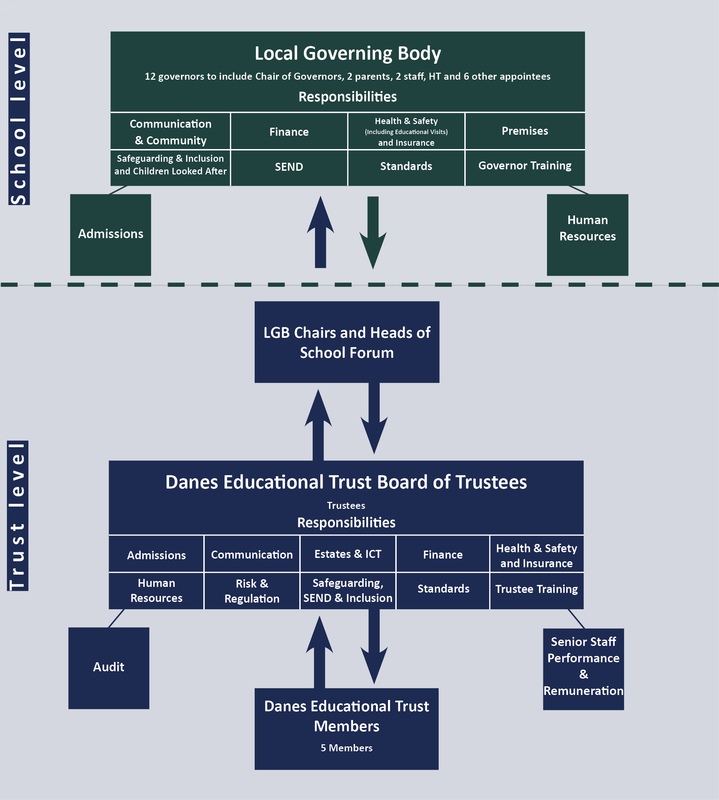 Each school within the Trust has their own Local Governing Board (LGB) which reports to the Danes Educational Trust Board of Trustees. Each body has specific Terms of Reference that ensure good governance practice at all levels. At both Trust Board and LGB level, there are currently two committees and several other areas of responsibility. Each of these areas and committees has a Lead Trustee or Lead Governor and a Professional Adviser from within the Trust or individual school. From September 2019, we are moving to a different structure at Trust Board level and will have Sub Committees for Audit, Risk and Compliance, Business, Educational Standards and Senior Staff Performance and Remuneration. Our members and trustees are a committed and talented group who bring a wealth of experience with which to support the Trust. Many have worked with St Clement Danes for a number of years, supporting it through huge changes, both in terms of the educational landscape and the buildings of the school itself. Below you will find further details. Those members and directors marked with an asterisk are also trustees of the Holborn Estate Charity (HEC). Chair of St Clement Danes Academy Trust since opening in June 2011. Vice Chair of St Clement Danes School Charitable Foundation from 2007 – 2014. Retired HR consultant. Owner and Managing Director at Kingswold Consultancy 2002-2008. 20 years teaching in the UK and abroad in the primary sector. 30 years association with St Clement Danes as a parent, governor and formerly Chair of Governors. HEC Trustee. Chair of Governors at St Helens School Northwood 2002-2014. Professional career as a management consultant in healthcare, currently a partner at The IT Health Partnership. Formerly roles as CEO of Ealing Hospital NHS Trust and Executive Director of Princess Margaret Hospital, Windsor. 30 years in HR within the civil service before moving to the private sector in 2010 as HR Manager for a Hertfordshire based Insurance Broker. Associated with St Clement Danes School as a parent and then a governor from 1998 to 2012. Hands on Chairman, Non-Executive Director and Mentor with over 20 years’ experience of growing businesses in difficult operating environments, formerly Head of Portfolio Management at Gresham LLP. Executive Director, Communications, at the Bank of England (2011-2014), following a career at the BBC where, until 2011, he was the BBC Business Correspondent. Currently contract director at BT Global. Experienced in contract and supplier management up to value of £1 billion, financial management and change management. Solicitor working at a legal publishing company, writing practical guidance for lawyers. Specialist in corporate tax law, with experience as a practitioner and professional support lawyer having trained as a solicitor at Linklaters LLP. Chair of the Trust Audit, Risk and Compliance Committee. 30 years prior to retirement as an executive of an international Aerospace Company, with non-executive director experience with the Department of Work and Pensions, an NHS Trust, and a local Housing Trust. On the Board of the Herts Local Government Pension Scheme. A former Headteacher, Louise has held a number of high profile roles in education. She joined HMI in 2002, eventually being put in charge of schools in Special Measures nationally. In 2013-14 she was made regional Director for Ofsted and National Director for Local Authorities. Headteacher at St Clement Danes between 1998 and December 2017. NLE since 2008, providing school to school support for six secondary schools in Hertfordshire through Executive Headship or leadership coaching. Leader of Herts & Bucks Teaching School Alliance.